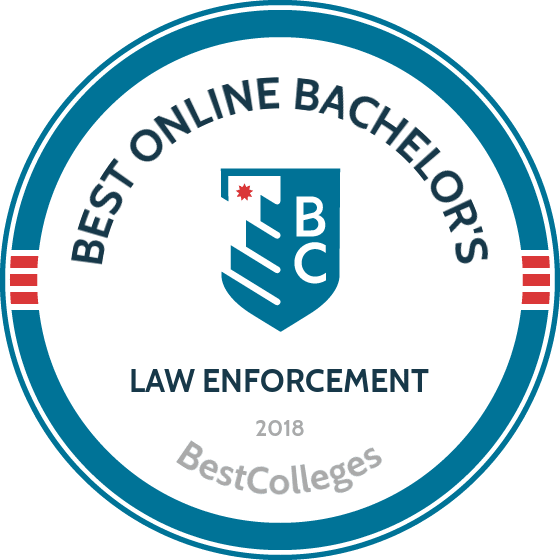 WHAT ARE THE BEST ONLINE BACHELOR'S IN LAW ENFORCEMENT PROGRAMS? What Else Can I Expect From an Online Bachelor's in Law Enforcement Program? From investigating cases to helping probationers get back on their feet, a degree in law enforcement prepares you to help serve and protect every element of society. Studies have shown earning a college degree have a positive impact on law enforcement officer performance, and as technology rapidly advances, a host of new security threats advance with it, making a relevant degree in the sector more useful than ever. As a college-educated law enforcement professional, you enjoy more possibilities, benefit from a greater earning potential, and are best positioned for changes in the field. Currently, most departments do not require entry-level officers to hold a degree, but many require some form of college coursework. As degrees become more commonplace, the need for law enforcement officers is likely to increase over time. According to the Bureau of Labor Statistics (BLS), jobs in law enforcement are expected to grow 4% between 2014 and 2024. Students without related work experience are in luck: most online bachelor's in law enforcement programs do not require any previous work experience. CAN I WORK WHILE I COMPLETE MY ONLINE BACHELOR'S IN LAW ENFORCEMENT? Typically, online bachelor's in law enforcement programs allow you to hold a job while you're in school. If you're working full-time, however, you may need to take a lighter course load, causing you to take longer to earn your degree. WHAT ARE THE ADVANTAGES TO EARNING MY MASTER'S IN LAW ENFORCEMENT ONLINE? There are several advantages to online bachelor's programs versus their traditional on-campus counterparts. Online programs offer more flexibility and convenience for people with busy lives, allowing you to log into programs any time of the week. Tuition for online programs is also frequently less than that of on-campus programs, and you don't have to move away to be closer to a school or make time to commute to campus. Based in Tallahassee, FSU offers a law enforcement degree for students with previous college coursework. Students pursuing a bachelor's of science in public safety and security can major in law enforcement intelligence or law enforcement operations. The curriculum covers the basics of the criminal justice system and topics including interrogations, investigations, and forensics. Both majors explore the human element of law enforcement, including diversity and ethics in the field. FSU delivers online programs asynchronously, so students can complete coursework at their convenience. Applicants must have an associate degree and at least a 2.0 cumulative GPA. Prerequisites include college algebra and statistics. Florida State University is regionally accredited by the Southern Association of Colleges and Schools. Based in Albany, Excelsior offers an online bachelor’s degree in criminal justice with a law enforcement and public safety concentration. The law enforcement online program is designed for working professionals in public safety and law enforcement positions. The program requires 120 credits, including general education courses and major courses such as criminology and research methods. Students complete a capstone paper assessing a problem within the field. The online law enforcement degree program requires no campus visits. The college awards credit for professional training in law enforcement, corrections, and related occupations. Excelsior also awards credit for military training, IT credentials, and prior learning assessments. Excelsior is regionally accredited by the Middle States Commission on Higher Education. In 2007, CSU-Global became the first 100% online, independent state university in the nation. The school delivers innovative bachelor's, master’s, and industry certification programs to nontraditional students in Colorado and elsewhere. CSU-Global's bachelor's in criminal justice and law enforcement administration is one of several programs offered 100% online and is designed for working adults. This law enforcement degree online is comprised of 120 credits with 18 optional specialization areas such as data management and analysis, criminal forensics, emergency management, organizational leadership, and project management; each specialization consists of five upper-division courses (15 credits). Courses are offered in an accelerated eight-week format with monthly starts, and are available every term. Online programs at CSU-Global are affordable and include a tuition guarantee, with tuition rates locked in for the duration of study. About 10,000 students attend classes at Bellevue annually, at 15 campuses in four states and through distance learning. Based in Nebraska, the university boasts a catalog of more than 75 degrees and certifications. Bellevue offers online learning to give working professionals opportunities to earn bachelor’s degrees in fields like adult education, business analytics, emergency management, and graphic design. The university delivers a 127-credit bachelor's of science in criminal justice, an online law enforcement degree focusing on the criminal justice system, corrections, and the courts. The curriculum, which emphasizes themes such as social issues, legal perspectives, and ethical principles, integrates theory and applied learning. Students are also required to take nine credits in the university's Kirkpatrick Signature Series, courses that examine the interplay among citizenship, limited government, and entrepreneurship. Distance learners pay the same tuition regardless of their state of residence, and Bellevue provides discounted tuition rates to active-duty members of the military. A nationally recognized institution known for its rigorous academic programs, Penn State-World Campus has a long history of offering students opportunities to earn a degree through distance learning. Students can choose from more than 125 in-demand degree and certification programs in fields such as engineering, education, business, and technology. Students seeking an online law enforcement degree should consider Penn State-World Campus' bachelor's of science in criminal justice. A 120-credit degree, the program includes general education classes, upper-level courses, and electives. Areas of focus include policing in America, corrections, police administration, and the juvenile justice system. Students have the option of enhancing the degree with an 18-credit homeland security minor, studying issues such as border security and emergency management. Students in the criminal justice program must complete a senior capstone project, where they explore developments in the field. Penn State-World Campus' online programs incorporate best practices in online delivery, are taught by faculty with experience in elearning, and use technologies that support student success. Penn State-World Campus' Military Grant-in-Aid program provides service members and their spouses with more affordable tuition rates. Founded in 1890, the University of Oklahoma is home to approximately 21,000 undergraduate students and 170 majors. The university, which has produced 29 Rhodes Scholars, delivers highly ranked programs in areas such as administrative leadership, prevention science, and liberal studies. In addition, OU’s Norman campus houses the National Weather Center. The OU Extended Campus College of Professional and Continuing Studies delivers a bachelor's of science in criminal justice, a 100% online, 120-credit degree that prepares students for law enforcement administration jobs. Areas of study include deviance and social control, comparative justice systems, and drugs in society. The program is delivered in an accelerated format with eight-week courses. While most students take four courses (12 credits) each semester, others take a full load of six courses (18 credits). Most students complete the program in two to three years; it is possible to graduate in 18 months with transferred credits and a heavy course load. Based in St. Louis, Webster offers an online bachelor’s of arts in criminology. The law enforcement online program requires 128 credit hours, including at least 43 major hours and at least one course in a foreign language. In addition to core courses, students complete criminal justice courses including crime control systems or corrections, radical extremists or white collar criminals, and crime mapping or demographics. The curriculum familiarizes students with techniques to predict and prevent crime. Webster limits online class sizes to 24 students, which creates opportunities for personalized instruction. Webster requires that distance learners log in regularly. Webster is regionally accredited by the Higher Learning Commission. Located in Natchitoches, NSU offers an bachelor’s of arts in criminal justice. Students earning the law enforcement degree online complete 120 credit hours, including a senior seminar course and coursework in sociology, psychology, and political science. Although NSU's law enforcement degree is primarily online, some courses require students to complete midterms or final exams on campus. Instructors may allow distance learners to complete proctored exams at a local university or testing center. NSU holds an annual job fair with law enforcement agencies from across the country in attendance. NSU is regionally accredited by the Southern Association of Colleges and Schools. One of the best law enforcement schools, online students at UMass Lowell can earn a BS in criminal justice in a fully online or hybrid format. The program requires 120 credit hours. Students must maintain a 2.0 cumulative GPA and a 2.5 GPA in criminal justice coursework. Students can customize the program through major electives such as courses in drug use, domestic violence, and child maltreatment. UMass Lowell allows criminal justice students to apply two courses toward both the bachelor's degree and a master's degree to accelerate their master's studies. UMass Lowell is regionally accredited by the New England Association of Schools and Colleges. Located in Delaware, Wilmington is a private institution delivering academic and career training to about 20,000 students in a range of disciplines. The university places an emphasis on career-focused programs, providing students with knowledge and skills wanted by employers. In addition, Wilmington offers flexible learning options at multiple locations, affordable tuition, and a generous policy that allows students to transfer up to 90 credits. Students in Wilmington's online bachelor's of science in criminal justice program gain expertise in the theories and practices of fields like law enforcement, corrections, courts, and parole. The school's criminal justice degree is one of the online law enforcement programs that allows students to build a personal program with an academic adviser. The curriculum includes an optional six-credit co-op assignment working in the administration of a criminal justice organization. Twenty thousand students from the U.S. and around the globe attend UofM to earn degrees in a range of disciplines. UofM is a major research university known as one of the most affordable public colleges in the nation. Students can choose from 17 bachelor's degrees in more than 250 programs in fields like arts and sciences, education, and business and economics. UofM offers affordable online programs, alternative degree pathways, accelerated learning, flexibility, and support services that meet the needs of busy working professionals. The school's bachelor's of arts in criminology and criminal justice is a law enforcement degree online that emphasizes research and community outreach. Students are taught by nationally recognized faculty as they study issues in criminology such as policing, corrections, capital punishment, gangs, and international crime. Classes can be taken 100% online or in a hybrid format. Situated in the heart of Brooklyn, SJC-New York provides its approximately 1,200 students with an academic experience rooted in career preparation and the liberal arts tradition. Distance learners have several degree options available through SJC Online, which offers heavily discounted tuition, a generous credit transfer system, remote access to the school library, and technical support. SJC-New York's bachelor's of science in criminal justice practice and policy is a multidisciplinary online law enforcement degree focused on evidence-based practices. The program is designed for working professionals in the field who are seeking to earn a baccalaureate credential. In addition to criminal justice, students will examine fields like philosophy, political science, psychology, sociology, and forensic bioscience. SJC-New York's 120-credit criminal justice program has rolling admission and requires at least a 2.0 GPA for students with prior college credits. WSU founded its bachelor's in criminal justice program in 1943. The university's online degree in law enforcement follows the same rigorous curriculum as its on-campus program. WSU’s program requires political science coursework, which improves students' understanding of the relationship between law enforcement and other government institutions. Students customize the degree through nine semester credits of criminal justice electives and three credits of arts and sciences electives. Distance learners participate in group discussions through Blackboard, and online students are welcome to participate in student government, student elections, webinars, and academic competitions. WSU is regionally accredited by the Northwest Commission on Colleges and Universities. Based in Seattle, CityU offers a bachelor’s in criminal justice with three pathways: justice administration, cyber forensic investigation, and corporate security and investigation. The law enforcement online program emphasizes practical field experience and includes a capstone course during which students examine case studies to develop their understanding of organizational pathology. Many CityU instructors are current law enforcement professionals. CityU awards credit for professional experience and military training. Graduates often pursue careers in corporate risk mitigation, cyber forensic investigations, and law enforcement. The Department of Homeland Security and National Security Agency designated CityU as a National Center of Excellence in Cyber Defense Education. CityU is regionally accredited by the Northwest Commission on Colleges and Universities. CU-Denver is a public urban research institution and academic health center. More than 14,000 students take classes at the school's campus in downtown Denver, while about 4,000 students complete coursework in advanced health care programs at the Anschutz Medical Campus in nearby Aurora. Additionally, CU-Denver delivers more than 20 degrees online, comprised of more than 450 courses. CU-Denver's 100% online bachelor's of arts in criminal justice is a 120-credit program that prepares students for jobs in law enforcement such as detective, crime scene investigator, lawyer, and marshal. Elective topics include corrections, juvenile justice, and victim services. Students seeking an accelerated program may choose to pursue the school's online bachelor's/master's of criminal justice dual degree, which can be completed with one additional year. Additionally, students can mix online and on-campus classes as their schedules require. CU-Denver offers an experiential learning team that provides students with access to internships, study abroad, and other opportunities. Based in Connecticut, Charter Oak offers a bachelor's of general studies with a concentration in criminal justice. The curriculum explores aspects of the justice system including police, courts, and corrections and emphasizes the value of integrity in the criminal justice field. The program offers specializations in general criminal justice and victim advocacy. The victim advocacy specialization examines the services available to victims, the rights of victims in the American court system, and the effects of domestic and sexual violence. Charter Oak's Women In Transition program provides financial assistance for low-income mothers pursuing online degrees. Charter Oak is regionally accredited by the New England Association of Schools and Colleges. Midway offers an accelerated law enforcement degree with eight-week terms. Midway’s fully online criminal justice degree program offers five start dates throughout the year. Students complete four upper-division psychology courses: abnormal psychology, forensic psychology, social psychology, and psychopharmacology. The program requires 33 credit hours of major coursework, including classes in police ethics; kinesic interviewing; and psychological, historical, and societal issues of terrorism. The program culminates in a capstone project. Many of the program instructors are criminal justice professionals. Online students have access to career services, including networking opportunities and additional skills training. Midway is regionally accredited by the Southern Association of Colleges and Schools. Students earning EKU’s law enforcement degree online complete flexible, asynchronous courses. The bachelor's degree in police studies allows students to design a customized degree plan, rather than following a set course sequence. The program requires 120 credit hours and is available entirely online. EKU's instructors have diverse backgrounds in the criminal justice field; some instructors have published extensive research in criminal justice, criminology, and police studies, and are retired police chiefs and academy instructors. EKU accepts up to 90 hours of transfer credit. All online students pay the same tuition rate, regardless of state residency. Eastern Kentucky University is regionally accredited by the Southern Association of Colleges and Schools. SAGU is a Bible-based school with curricula designed for theological and related professional studies. In addition to academic achievement, SAGU seeks to foster students’ spiritual formation, developing character and lifelong spiritual growth. Many of SAGU's bachelor’s and master’s programs are delivered in a 100% online format and are accessible 24/7. The university's bachelor's of arts in criminal justice is an online law enforcement degree designed to equip students with the concepts, theories, and skills required in the criminal justice field through a Christian perspective. The program requires students to complete 127 credits, and areas of study include criminal investigation, criminology, penology, constitutional law, and criminal justice administration. SAGU offers students the opportunity to earn up to 45 credits through an experiential learning course where they demonstrate prior knowledge and work experience. Distance learners have access to resources such as tutoring, learning centers, and career services. Located in South Carolina, AU prepares students for success in their career, community, and church through its liberal arts curriculum. Students can choose from 40 degrees and 38 concentrations at bachelor’s, master’s, and doctoral levels. The university offers distance learning, giving working students the flexibility they need to advance their careers in fields such as business administration, Christian studies, organizational leadership, and human services. AU's 100% online bachelor's of arts in criminal justice with a concentration in law enforcement is 120 credit hours, 36 of which are general electives. The program, structured with eight-week courses, is taught by professors with real-world expertise in the field. Core areas of study include criminal law, criminal investigations, constitutional law, the correctional system, and social problems. Upon enrollment, each student is paired with an AU journey coach, who provides academic advisement until graduation. Graduates are prepared for positions in law enforcement at local, state, and federal levels, including the FBI and the Secret Service. NCCU offers a bachelor's in criminal justice with a concentration in law enforcement. The university offers the degree in law enforcement entirely online, and students who hold an associate degree can complete the program in two years. This online criminal justice program requires 57 credits. Students complete eight-week sessions, and students pursuing the program in a hybrid format attend a five-week summer session at Wake Technical Community College. NCCU students must maintain a 2.5 GPA. Applicants must have at least a 2.0 GPA. Applicants without at least one year of professional experience in the field must complete a practicum course. NCCU is accredited by the Southern Association of Schools and Colleges, and the criminal justice program holds certification from the Academy of Criminal Justice Sciences. BSU offers a BS in criminal justice with an emphasis in law enforcement. The BSU law enforcement program meets many of the Minnesota Board of Peace Officer Standards and Training requirements for law enforcement positions in the state. The program prepares students to sit for the Peace Officer Licensing Exam. Applicants must have completed at least 24 semester credits. The ideal applicant holds an associate degree or has completed the Minnesota transfer curriculum. The program offers courses in conjunction with BSU's indigenous studies program, which focuses on tribal law and government. Although not required, the indigenous studies coursework benefits law enforcement students considering police work in indigenous communities. Rowan's bachelor’s of law and justice is designed for students with previous college experience. Applicants must have an associate degree or at least 24 transferable credits from an accredited college or university. Rowan's criminal justice program requires 36 core credits and 24 elective credits. Core courses explore topics including juvenile justice, sentencing, the rights of the convicted, and laws regarding the admissibility of evidence. Most students complete core components in four or five semesters. New students with fewer than 60 previous credits must complete additional general education coursework. Rowan University is regionally accredited by the Middle States Commission on Higher Education. At UCM, students have access to more than 150 academic programs that provide hands-on experience, including service-learning projects in the community. The university's approximately 14,000 students come from 42 states and 61 countries, and 92 percent of them are employed within six months of graduation. The school’s 120-credit bachelor's of science in criminal justice features a curriculum that includes courses in policing, courts, juvenile justice, corrections, victimology, and international justice. The program is available entirely online, with no mandatory in-person components. Graduates are prepared for jobs in law enforcement or for graduate studies, including law school. At UCM, students may enroll in an accelerated, combined bachelor's/master's program, through which they can graduate with a bachelor’s and master’s degree in criminal justice in five years. All distance learners at UCM pay the same tuition rate regardless of their state of residence. Saint Leo University, a Catholic college, educates 2,200 students on its campus in central Florida, with 14,000 more studying at regional sites and online. The school's eLearning platform includes the bachelor of arts in criminal justice. The degree qualifies professionals to work in law enforcement, investigating crimes and correcting criminals. They learn the latest techniques from faculty who have experience as detectives, crime scene investigators, FBI advisers, and chief deputies. The curriculum of the online law enforcement degree includes the study of criminal law, criminal procedure, police organization and administration, and forensic science and criminal justice. Students receive hands-on training through internships with agencies such as the U.S. Secret Service and the Florida Department of Law Enforcement. Learners examine the role that the jury plays in the criminal justice system. Other experiences include a visit to a death chamber at a prison and an opportunity to examine fingerprints in a forensics lab. Admission requirements include a high school diploma or GED and school transcripts. Below, you'll find plenty of information on what you'll learn, how long your degree will take to earn, how programs are accredited, what to expect after you graduate, and how you'll pay for your degree. Keep in mind that details may vary depending on the particular online degree in law enforcement program. Introduction to Criminal Justice: Providing a broad survey of the field of criminal justice and the careers paths you can take, this is typically the first course you'll take as part of your major. Introduction to Criminal Justice may include the history of law enforcement, the role of police in society, and how police, courts, trials, and corrections operate. Ethics in Law Enforcement: Future law enforcement professionals must abide by strict moral and ethical guidelines. As a result, most programs require a course where students study the theories, applications, and methods of ethics in police work. Courses like this often includes a look at how race, class, and gender factor into police work. Criminal Law: Most programs require students to take at least one course on the fundamentals of criminal law, particularly issues that are relevant to law enforcement professionals. Such courses generally feature an overview of constitutional law and how it relates to the everyday work of police. These courses survey topics such as the basics of evidence collection and preservation, and criminal law procedures. Police Strategies: Law enforcement professionals use several fundamental elements to combat crime, and you'll likely take a course that reviews and analyzes these strategies. This course may include a look at how police strategies have changed over time and how they may change in the future. Course topics may include community policing, prevention, patrol strategies, police reform, and intervention. HOW LONG DOES IT TAKE TO GET AN ONLINE BACHELOR'S IN LAW ENFORCEMENT? Generally, online bachelor's degrees in law enforcement programs consist of 120 semester credits. How long your degree will take you will depend on several factors. Full-time, entering freshman can complete a degree in about four years. Some programs offer accelerated formats, wherein you can complete your degree in less than four years. Most programs feature summer courses, which can also cut down on the time it takes you to earn your degree. Some programs allow you to learn at your own pace, and others require that you complete all classes in a cohort of other students, often at an accelerated pace. Others still are only open to students with transferable credits, so the program can be completed in even less time. One of the most important things to look for when you're choosing an online degree in law enforcement program is whether or not the program is accredited, and what type of accreditation the program holds. Accreditation is a process colleges and universities go through to ensure that they meet certain standards for education quality. Most colleges and universities in the United States hold regional accreditation. A much smaller percentage of colleges are nationally accredited. The difference is important: regionally accredited schools tend to have more prestige because they're the best recognized. It's also easier to transfer credits from a regionally accredited college. However, regionally accredited colleges also tend to be more expensive and have more rigorous admissions and academic standards than nationally accredited colleges. Regional accreditation agencies include MSA, NEASC, NCA, NAC, SACS and WASC. National accreditation agencies include DETC, ACICS, and ACCSC. Several different organizations are involved in accreditation. The United States Department of Education (ED) does not itself accredit colleges and universities, but the ED does recognize and offer guidance to independent accrediting agencies. The ED also publishes a database of the accrediting agencies they deem to be reliable authorities. The Council for Higher Education Accreditation (CHEA) is an independent, nongovernmental organization that recognizes 60 accrediting organizations and about 3,000 colleges and universities. The accrediting organizations recognized by CHEA are assured of their quality and legitimacy as degree-granting institutions. You can find a directory of accredited schools on the websites of both the DOE and CHEA. A bachelor's degree in law enforcement is an asset in the job application process. Some agencies even require it: federal agencies like the FBI, the DEA, and ICE all require applicants to hold a college degree. Some state police and local agencies may also require a degree. Agencies that do not require a degree often encourage one, and a degree often gives a candidate a significant advantage in the application process. A bachelor's degree is also often a requirement for promotions. With a bachelor's degree in law enforcement, graduates are prepared for entry-level positions at local, state, and federal departments and agencies. While policing remains the most popular career path, graduates also pursue career paths in areas such as probation, corrections, and emergency management. Individuals hoping to pursue a career in law enforcement must be inquisitive and empathetic, must display strong communication and leadership skills, and must nurture a solid sense of judgment. Anyone intending to pursue law enforcement should also be in good physical shape. Law enforcement professionals must also work long, odd hours, so an expectation of flexibility is key. Police officers enforce the law and help protect people and property. For example, they may respond to calls, patrol neighborhoods, conduct traffic stops, and monitor suspects. Detectives are tasked with, for example, collecting evidence, gathering facts, conducting interviews with witnesses and suspects, observing suspects, and examining records. Bailiffs work in courtrooms to maintain safety, security, and order. They enforce the rules of the court, announce the arrival and close of the court, and may administer oaths and perform other administrative duties. Emergency dispatchers answer 911 calls and other emergency and non-emergency services. They relay information to appropriate agencies; monitor, track, and coordinate dispatch; and provide basic advice and medical instructions to callers. Probation officers work with people on probation with the goal of preventing them from committing crimes in the future. They evaluate and monitor probationers and help them access resources like job training and substance abuse counseling. There are a few major professional organizations for law enforcement students that offer a number of excellent opportunities for students. Networking, conferences, career enhancement programs, subscriptions to journals and other publications, job interviews, and online job boards are just some of the benefits these organizations provide students and recent graduates. The ACJS is an organization for criminal justice and criminology students, scholars, educators, and policymakers. They group publishes numerous academic journals, holds an annual national conference, and hosts a job board. The ACJA-LAE is a criminal justice student organization that holds national and regional conferences, offers scholarships and scholastic awards, and publishes journals. A law enforcement professional organization with over 27,000 members, the IACP offers students enrolled in an accredited law enforcement program access to networking, professional development, and discounts on its several annual conferences. Most bachelor's degree students need help paying for college. Federal loans, private loans, scholarships, grants and work-study jobs are some of the most common ways to make college affordable. Loans provided by the government may be subsidized, with the government paying some of the interest on the loan, or unsubsidized, where the student pays the interest. Filling out the Free Application for Student Aid (FAFSA) is the first step in this process.